The Chapin 63985 is a general purpose backpack sprayer powered by a Black and Decker lithion 20 volt battery. No arm and hand fatigue with a battery powered backpack sprayer. Constant pressure – no fluctuations like you have with a manual hand pump sprayer. Designed for your home, lawn, garden, weeds and pests. You can use this sprayer for cleaning, fertilizers, weed & feed, fungicides, herbicides and pesticides. 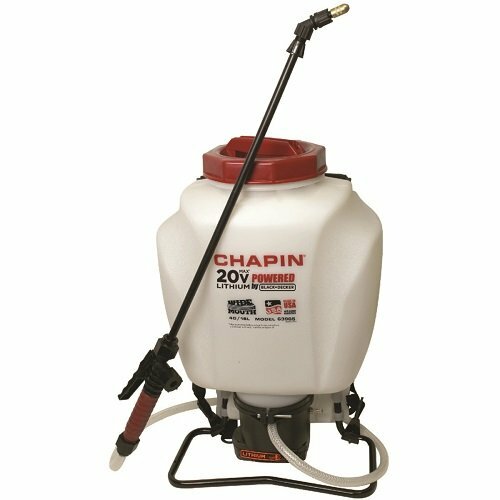 Because the Chapin 63985 battery operated backpack sprayer is a general use sprayer, you have the option to use it for many different applications, BUT… you should never mix the applications. Meaning…if you have used plant or herbicide chemicals already in the sprayer you should not then use it for general household cleaning purposes unless you have thoroughly cleaned the tank, hose and wand to ensure that there are no plant chemicals remaining. You can use different spraying patterns for spraying plant food outdoors. If you have used your sprayer to for herbicides or pesticides, make sure that it has been well cleaned before you use it for plant food. You can spray both fungicide and pesticides with this sprayer outdoors. Reduce weeds and any other unwanted plants in your yard, garden or field by spraying herbicides. You can use detergents and warm water in the sprayer to clean counters, carpets, floors, glass and ceilings. Once again, ensure that the unit is well cleaned of any other chemicals before using it for general cleaning. Great for cleaning windows, fences and siding. This is a 4 gallon translucent poly tank which allows you to see the line of liquid in the tank so you know how much solution you have remaining for the job. The tank opening is one of the widest in the industry with a 6″ cap for easy pouring. The wand length is 20″ with a hose length of 4 feet (48″) to provide flexibility and easy mobility while you are spraying. The unit comes with three different spray nozzles: adjustable brass cone, ploy fan and poly-cone. Provides a consistent 30 foot horizontal spray stream. The PSI is a constant 35-40 psi as the battery power keeps the unit going. No up and down pressure fluctuations like you would have in a manual pump sprayer. Being battery powered, you will have consistent spraying for 1.75 hours. Comes with padded shoulder straps, but no padding for the back. The batteries need to be charged for 3-4 hours before using and once they are fully charged you can work with a continuous spray for nearly 2 hours. To charge the battery, plug in the charger and insert the battery pack. The green LED light will flash indicating that the battery is being charged. Once the battery is completely charged, the green light will stop flashing and will remain constantly on. You can now use the battery in your sprayer or leave it in the charger. It is recommended that you recharge your battery immediately after use. Click on the video below to watch the demo on the Chapin 63985 backpack sprayer.